Deb's Cup of Tea: Now What Did You Do? 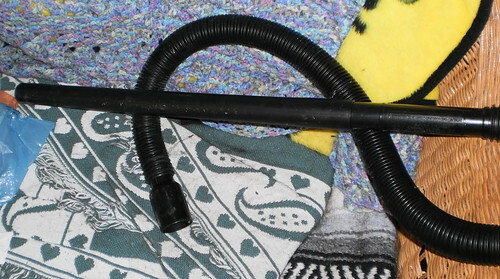 Yes, this is the hose to my vacuum. I came home last night and couldn't find Mija. My friends, April and Perry, had gone through an hour of panic because their cat, Clark, was nowhere to be found when Perry came home from work. April was scared he had gotten out of the house. After driving around the neighborhood for an hour, they came home and he came sauntering out of the family room. No clue where he was. Pilchard had come running as soon as I came home, but Mija didn't and she usually does. I searched the house, which doesn't take that long to do. I checked the windows. I have screens in some of the windows now as the temperatures have warmed up. None of the screens were missing and, frankly, Mija doesn't stay outside long even when I allow her to be outside because I'm outside, so I honestly didn't think she'd go out. But, the longer she remained missing, the more I grew concerned that she injured herself somehow. Try as you might, there are still things in a home a cat could get into and injure themselves. She could have decided to jump down the laundry chute and now can't get out, but I'd hear her meowing and there was no meow. Then, she came out from under the settee. Pilchard took her place. I gave them a few treats and they went back to sitting by the ottoman next to the settee. They were just staring under it. Oh lord. Generally, that means someone caught something and it got loose. I looked, but all I could see was the above hose and dust bunnies the size of oranges. I really need to sweep my floors. All night, they took turns sitting and staring. Every time I walked past that section, they were there, sitting, waiting. I couldn't see a thing when I'd get down and look. Mija caught a moth on Monday so I thought maybe someone had a moth and they were stalking that. I also had the thought that maybe it was a mouse and said rodent ran into the open end of the hose to get away. I dismissed that notion mainly because I really didn't want to consider it. About 15 minutes after I'd gone to bed, there was a flurry of activity and then a series of high pitched squeaks. Mouse. I jumped up as Mija chased it into the back room. It wasn't very big, a mere snack size for her, really. But you know cats. They like to play with their prey. She carried it into the living room, dropped it and chased it around. I managed to scoop it up in a towel and toss the thing outside. I have no idea who caught it. Probably Pilchard as she's the one who caught the others. We had a good 5 months with no mice in the house. You'd think they would get the idea this is not a good place to visit. And memo to self, reattach the hose to the back of the vacuum. The last thing I want is some mouse to die inside the hose.